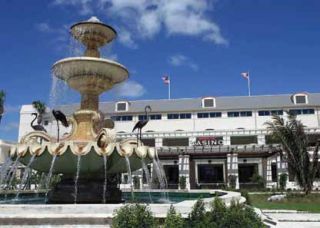 Constructed in 1932, Hialeah Park is an architectural wonder in southern Florida that hosted some of the world’s finest horseracing until it shuttered its doors in the late 1990s under pressure from the shifting tides of modern gambling. A new sound system infuses Hialeah Park Racing & Casino with full-fidelity music 24 hours a day, seven days a week using 22 SymNet Edge Dante-networked audio DSPs and Tannoy loudspeakers. Originally constructed in 1932, Hialeah served as the setting in numerous Hollywood films, including The Champ and The Godfather: Part II. Its resplendent Spanish décor impressed the many celebrities who graced its grandstands, including Winston Churchill, Frank Sinatra, Harry Truman, Will Rogers, John Kennedy, and Joe DiMaggio. Its iconic palm trees and archways also served as the setting in numerous Hollywood films, including The Champ and The Godfather: Part II . Hialeah Park recently leveraged the weight of that history to launch Hialeah Park Racing & Casino, which pairs quarter horseracing with a casino built into the interior of the historic grandstand. A new sound system infuses the casino with full-fidelity music 24 hours a day, seven days a week using 22 SymNet Edge Dante-networked audio DSPs modularly outfitted with 12 inputs and 300 outputs. Each SymNet Edge frame can be filled by up to four I/O cards. The available I/O cards cover the full range of possible I/O needs, but for Hialeah Park Casino, Hey simply installed three four-channel analog input cards and 75 four-channel analog output cards into 22 SymNet Edge frames. While each Edge frame has its own processing resources, the whole system acts as one integrated whole via the Dante network. Each speaker location includes a five-inch loudspeaker, an eight-inch loudspeaker, and a subwoofer. All the components are Tannoy with the SymNet Edge processing turning each location into a three-way system. Lab.gruppen amplifiers are used for power.